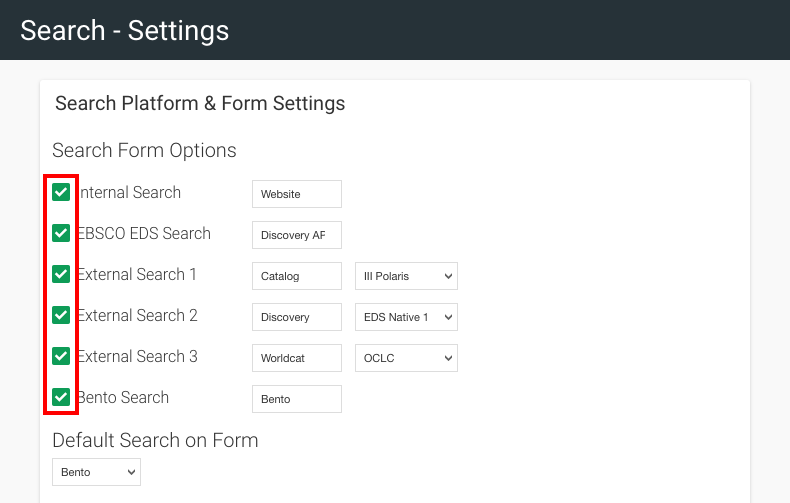 Manage search formats, integrations, configurations and default settings. 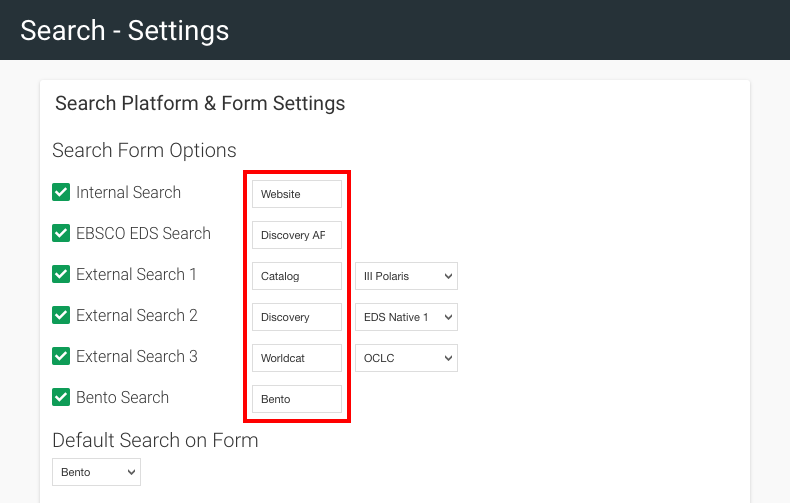 Depending on how your Stacks site is configured, users may have the ability to search using EBSCO Discovery Service, an external catalog, Bento box search, and website search. 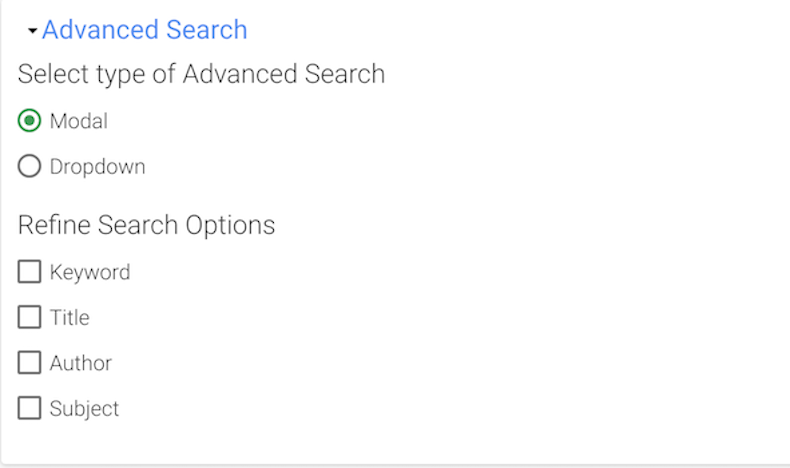 Your users can choose which of these search options they prefer from a convenient drop-down menu located just to the right of the search bar. 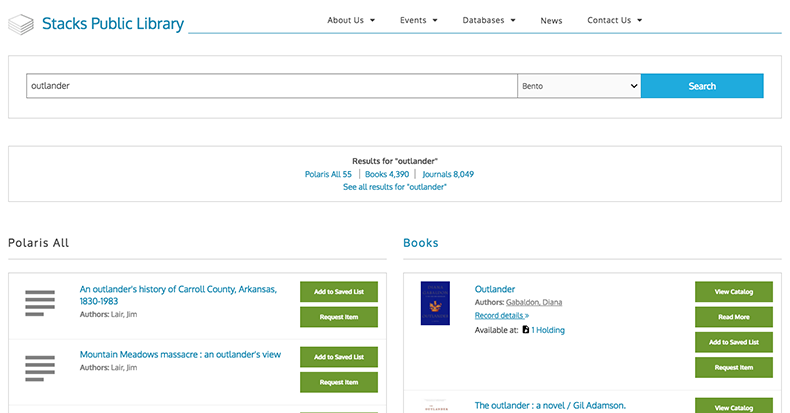 If you are able to log in, you will also be able to save an item to a 'Saved List' to reference at a later date. VIEW CATALOG - Exposes the ILS DeepLink (not SSO) and takes the user out of Stacks to the item details page in the catalog. ADD TO SAVED LIST - Requires "Patron" role authentication and saves to Stacks "My Account"
For any search option chosen in search Settings, provide the appropriate credentials. You may provide additional credentials, though only those searches which have been selected will be enabled. Conversely, if credentials have not been provided, the search will not return any results for your users. Here is an example of a library with III Millenium as an External Catalog in settings. You must also provide III credentials in the External Catalogs configuration. A Bento search will display results sorted by item type. You may choose to include just one type, say books, or many types such as books, academic journals, DVDs, etc. Result types are grouped together in Bento ‘boxes’ for easier navigation by users. Note: Bento Search can also be implemented on Multidomain sites. Each site must have the same number of columns on their Bento page but they can configure their own content in their individual bento boxes. 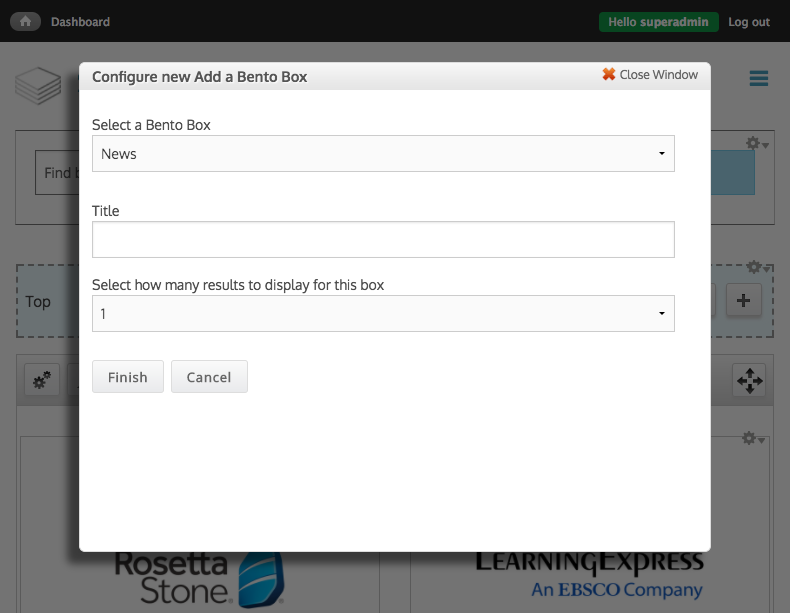 Stacks allows you to create custom bento boxes with an EBSCO Discovery Service Integration. These boxes can be built based on subject, source type or content provider. Note: The labels for each of these buttons can be changed in "Site Labels" (under the System Configuration tile) and will be applied anywhere the corresponding button appears on the site. 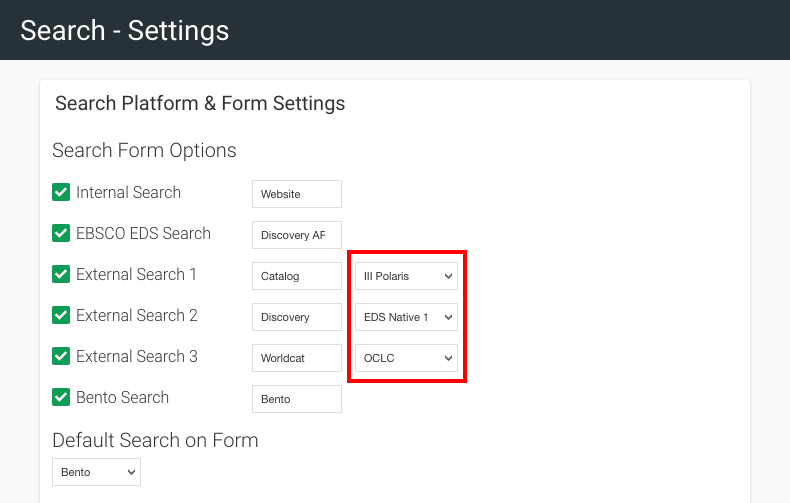 Depending on how your Stacks site is configured, users may have the ability to search using EBSCO Discovery Service, an external catalog, bento box search, or website search. Your users can choose which of these search options they prefer from a convenient dropdown menu located just to the right of the search bar. If you are able to login, you will also be able to save an item to a 'Saved List' to reference at a later date. After performing a search, users can save their search criteria for quick reuse at a later date. Saved Search functionality requires ILS (Integrated Library System) Authentication and EDS (EBSCO Discovery Service) authentication.